Randy and Debbie were excited. They jumped up and down. 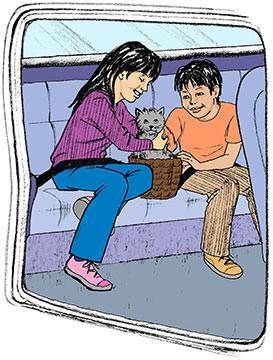 "Today we are going to Grandma's house," Debbie sang. "We will go in Daddy's car," Randy shouted. "I hope you won't cry or fuss or be any trouble to Grandma," Mother said. "We'll be good," Randy promised. "Can we take Scrappy?" Debbie asked. "Yes, but you must look after him," Mother answered. "Your father and I are going on to stay with Uncle Walter tonight." The children ran and got Scrappy's basket. They put it in the car beside them. 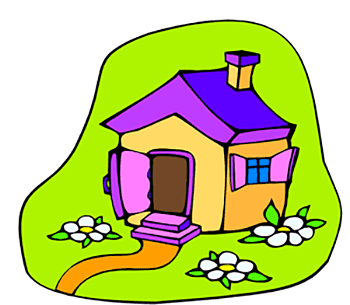 "I'm glad Scrappy did not belong to the neighbors," Debbie said as she put Scrappy in the basket. "Scrappy is ours now," Randy said. "We will always take care of him." The sun was far down in the sky when they got to Grandma's home. Randy and Debbie smiled as they waved goodbye to Mother and Father. Grandma gave them each a big hug. "Come in and have your supper," she said. 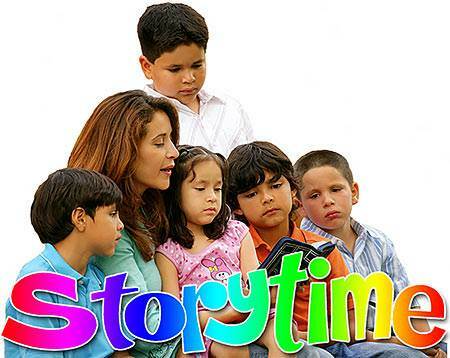 "Then I will tell you a story before you go to bed." Soon the children were ready for bed. 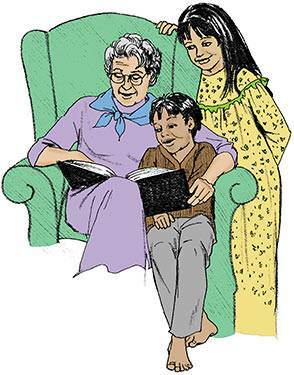 Grandma began, "One day the Lord Jesus was talking to His disciples. He told them not to be afraid." "What are disciples?" Debbie asked. "He told them that He would give them everything they needed. He said that He would watch over them and keep them safe." "The Lord Jesus told them that He loved them. He said, 'I am with you always.'" "Jesus loves us, too," Randy said. "Yes," Grandma agreed. "When we ask the Lord Jesus to forgive our sins and be our Saviour, we belong to Him. Jesus loves us and cares for us just like He cared for His disciples." 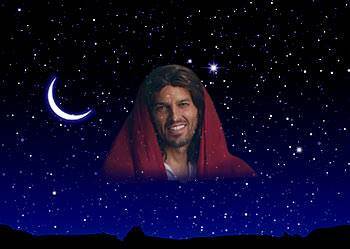 "Is Jesus with us at nighttime?" Debbie asked, leaning her head on Grandma's shoulder. "Yes, Debbie," Grandma answered. "Remember, Jesus said, 'I am with you always.' That means day and night. It means that Jesus is with us wherever we are. We do not need to be afraid because the Lord Jesus has promised to look after us all the time." 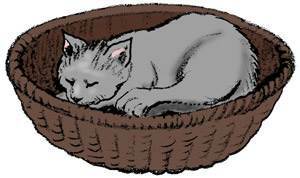 When Grandma had finished her story, the children put Scrappy in his basket in the kitchen. "Good night, Scrappy," they said. Then they went upstairs to bed. During the night Debbie woke up. The wind was blowing hard. It made a howling noise. Debbie did not like the sound. It made her feel afraid. Debbie slipped out of bed and went into Randy's room. She pulled at Randy's blanket. "Randy," she whispered in a trembling voice. "I want to go home." Randy sat up in bed. "We can't go home until morning, Debbie," Randy said. "We promised not to cry and bother Grandma, remember?" Debbie sniffed. "I think Scrappy is lonely," she said. "I don't," said Randy, getting out of bed. "But come on and we'll see." Randy took Debbie's hand. Very quietly they tiptoed down the stairs. They knelt before the basket in the kitchen. The moon shone through the window on Scrappy. He was curled up, fast asleep. "See!" Randy said. "Scrappy isn't one bit afraid. He knows we will look after him. And the Lord Jesus has promised to take care of us. We should not be afraid either." Debbie smiled as she wiped the tears from her eyes. "I remember now," she said. 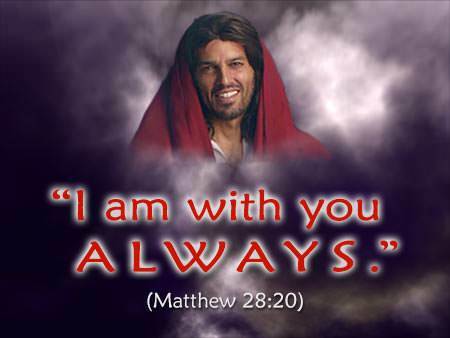 "Jesus said, 'I am with you always.' That's the verse Grandma taught us." "Yes," said Randy. "The Lord Jesus is with us in the dark when the wind blows. He will keep us safe." Debbie gave a big yawn. "I'm not afraid now," she said. "I'm going to go to sleep just like Scrappy." "Let's whisper our verse as we go up the stairs," Randy said. "We will say one word on each step." 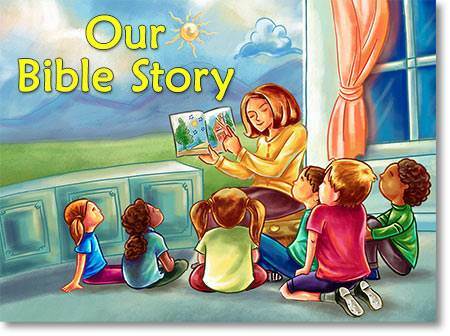 The children had said the verse twice by the time they got to the top of the stairs. Then they went back to bed and were soon asleep. Be sure to learn the same Bible verse which Randy and Debbie learned! Randy and Debbie get into big trouble in the next lesson. Don't miss it! When the Lord Jesus was here on the earth, there were some men who believed on Him and followed Him. These men were called "disciples." Jesus taught them many things. He gave them power to heal sick people and even to raise the dead. Jesus told His disciples to tell the people of Israel that God's kingdom was at hand. 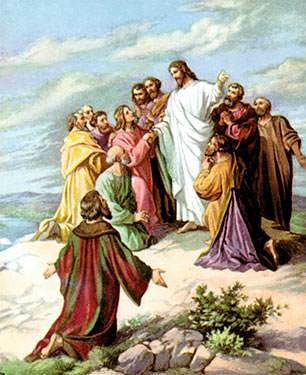 Jesus told His disciples that they would be treated badly. Some people would hate them. Some would hurt them. Some people would even try to kill them. But Jesus told them that their heavenly Father would be watching over them. Nothing would happen to them without God's knowing about it. 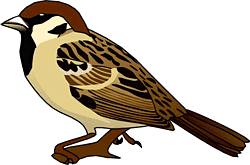 To show His disciples how God would watch over them, Jesus said that not even a little sparrow could fall to the ground and die without their heavenly Father knowing about it. Jesus said, "You are of more value than many sparrows." Jesus wants us to know that our heavenly Father watches over us too. God knows all about us. Jesus said, "The very hairs of your head are all numbered." Just think! God knows how many hairs are on our head. Our heavenly Father loves us very much! 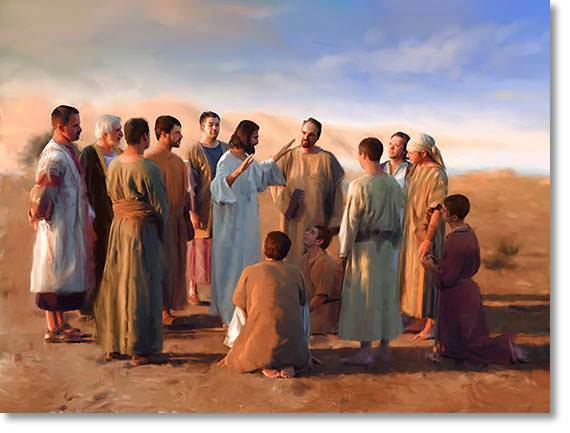 When Jesus went back to Heaven, He told His disciples to go into all the world and to preach the gospel to every person. Jesus wants everyone to know that He died for their sins and that He wants to be their Saviour. If we have taken Jesus as our Saviour, He wants us to tell others too. And He has promised to be with us always. He said, "Yes, I am with you always." How wonderful it is that Jesus is always with us!